What this clip and see if you can stop yourself from giggling. 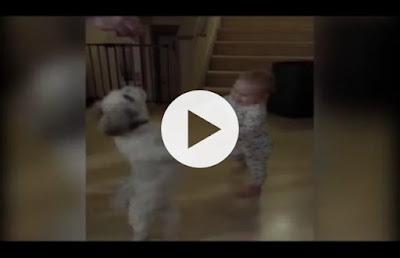 What makes this baby imitate a dog? It is certainly not because doggy treats smell good. Infants are continually watching our actions and committing them to memory. This is an amazing thing given the fact their brains are still learning how to create and retrieve long term memories. Infants are even born able to imitate as research on babies less than two days old shows infants imitating facial expressions. Research has shown us that infants have four basic ways of learning. They mature and develop skills such as large motor skills. They learn from trial and error. They learn from exploration, and they learn from imitation. This is good news for parents. It means that we do have a strong influence on our children – an even stronger influence than the family dog! It means that children are learning from us, even when we do not see evidence of that learning. What children learn in a loving family is what is buried deep in the neural connections of the brain. Use this learning/teaching gift God has given you. What can you model for your children today?